Get actionable tips and advice from your personal career coach Lauren Milligan on how to improve your resume, interviewing skills and your overall job-search strategy. 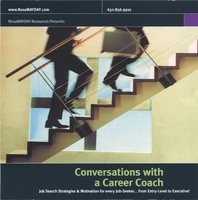 Receive a FREE RESUME REVIEW ($50 fee waived) when you purchase Conversations with a Career Coach Audio Book in CD format. What you will learn – Develping career goals, staying motivated during job searches, resume development, career transition, interview skills and more. About Lauren Milligan – Resume Consultant Lauren Milligan founded ResuMAYDAY in early 2001. An active member of many networking and business organizations, Ms. Milligan grew ResuMAYDAY from a one-person operation to a corporation that works with national and international clients. She has appeared on radio, television, print and the web including The New York Times, ABC, WGN Radio, CNN and more.